Caricature of the founding of Kreuzzeitung, the mouthpiece of the Prussian Conservative Party. The drawing shows party leaders Ernst Ludwig von Gerlach (middle), Friedrich Julius Stahl (right), and Otto von Bismarck (left). Gerlach is portrayed as Peter von Amiens (1050-1115), one of the most prominent leaders of the First Crusade. 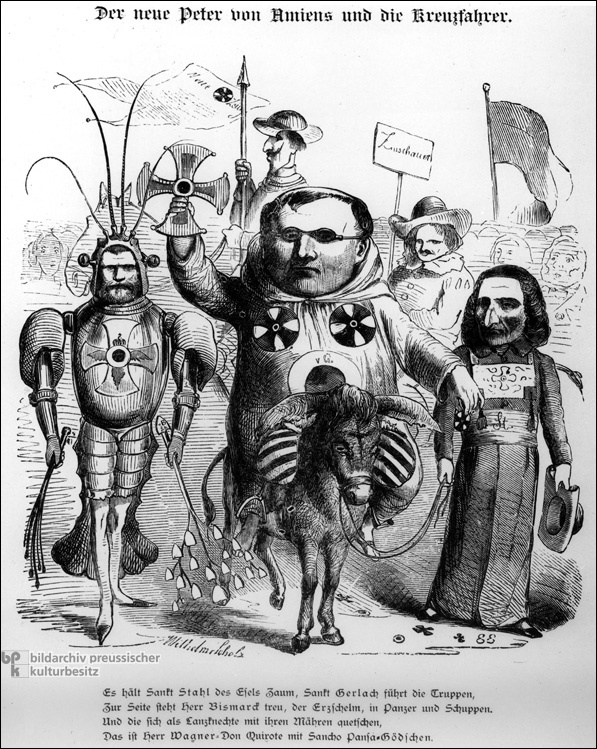 The subject of the caricature is the "crusade" of monarchist conservatives against the liberal-democratic goals of the revolution. The verse underneath the image reads as follows: "Saint Stahl holds the donkey’s bridle, Saint Gerlach leads the troops,/ At his side stands loyally Mr. Bismarck, the arch-rogue, in armor and scales./ And the lance holders who barely managed to mount their old nags,/ They are Mr. Wagner-Don Quixote and Sancho Pansa-Gödschen." Drawing by Wilhelm Scholz (1824-1893), published in Kladderadatsch, 1849.